The chief dealer at Irish Life and Permanent said it was made clear there was to be "no idle chit chat" about the bank's transaction with Anglo Irish Bank in September 2008. David Gantly said rumours were rife in the market about banks going bust and therefore confidence was key. Mr Gantly gave evidence at Dublin Circuit Criminal Court on day 55 of David Drumm's conspiracy to defraud trial. Mr Drumm, 51, former CEO of Anglo, accepts that multi-million euro transactions took place between Anglo and IL&P in 2008 but disputes they were fraudulent or dishonest. Mr Gantly told Mary Rose Gearty SC, prosecuting, there was a huge fire-fighting exercise going on every day to cope with the level of outflows at the bank. He said the Financial Regulator was not happy that IL&P had received funding from the European Central Bank during the "cataclysmic crisis" in 2008. He said the regulator was uncomfortable with use of this safety net. "It was a one in a hundred years event. There was a sense the cavalry were going to come over the hill at any time, but we just didn't see it," he told Ms Gearty. Mr Gantly said he met officials from the Financial Regulator and the Central Bank in March 2008. He got the impression the regulator was not happy with IL&P's reliance on ECB money and did not want the bank "openly telling the market" about its borrowings, the jury heard. Mr Gantly said Denis Casey and Peter Fitzpatrick, who were "number one and number two" at IL&P, had additional meetings with the Central Bank in the following days. He told Ms Gearty that it was at this time he first heard about the "green jersey agenda". The jury has previously heard this refers to the practice of Irish banks helping each other during the crisis. Mr Gantly said Mr Casey told him to make contact with his counterpart in Anglo and in the other Irish banks. "Anglo were losing some corporate deposits, which came as no shock, and they were targeting a certain number," he said. He said that during discussions at IL&P he said it was "not a normal type transaction". He told Ms Gearty that Mr Fitzpatrick told him the bank had been encouraged by the Regulator "to do this". 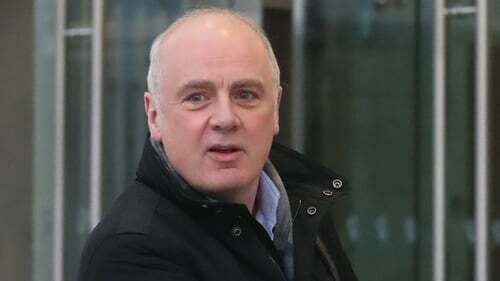 Mr Drumm, of Skerries, Dublin, has pleaded not guilty to conspiring with former bank officials Mr Casey, William McAteer, John Bowe and others to defraud depositors and investors at Anglo Irish Bank by "dishonestly" creating the impression that deposits in 2008 were €7.2 billion larger than they were. The bank's former CEO has also pleaded not guilty to false accounting on 3 December 2008, by furnishing information to the market that Anglo's 2008 deposits were €7.2bn larger than they were. The trial, is now in its eleventh week, and continues before Judge Karen O'Connor and a jury of ten men and four women.